Naples based catering company invited to participate in no waste food even in San Diego. Naples, FL (August 31, 2018)…Tastebuds Custom Catering was invited to participate in Bash!d Up, a no waste food event to promote awareness and showcase a more organic way of consuming food that would normally go to waste. The Wild Thyme Company’s Chef Keith Lord, who coined the term #nowastechef, organized the event and invited Greg Shapiro, Executive Chef and Owner of Tastebuds, to get involved. Shapiro is highly motivated by collaboration with other chefs and passionate about innovation within the food industry. 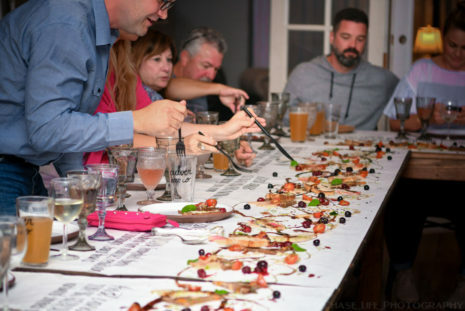 Shapiro traveled to San Diego in June to participate in Bash!d Up, where he and Lord, alongside local celebrity chefs Davin Waite and Willie Eick, each prepared their own course using overlooked parts from produce and animals that would normally go to waste. 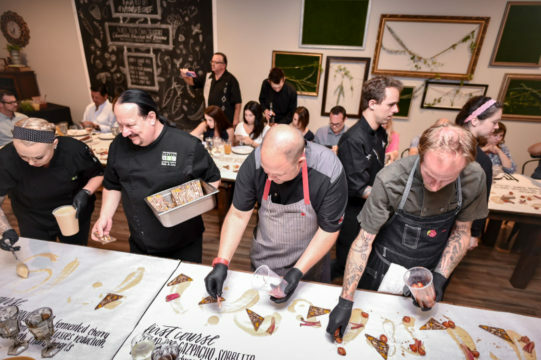 The event was interactive, meaning the chefs explained everything they used and why they used it to the nearly thirty guests who purchased tickets to Bash!d Up, held at the bash! Boutique in San Diego. “At Tastebuds, we are extremely passionate about creating unique dishes for our customers. It’s even better when we can learn to incorporate food that would normally be wasted due to small imperfections. The trend toward environmentally sustainable cooking is taking off and we are planning to run with it,” says Shapiro. Shapiro and his wife Heather (the Director of Operations for Tastebuds) travel frequently to garner inspiration for their dishes. The duo is currently working on entrees and hors d’oeuvres for this winter and spring of 2019 based on their travels and studies. The Shapiro’s are “excited to use what they learned in San Diego to inspire other no waste dishes for their upcoming seasonal menus in southwest Florida”.